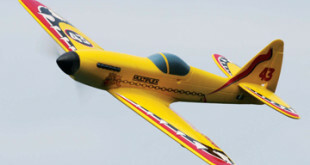 Multiplex is well known for their line of precision molded foam airplanes, including easy-flying trainers and gliders, twin-engine transports, seaplanes, nimble aerobats and high-performance sport flyers. The new DogFighter brings the excitement of WWII style aerial combat and post-war air-racing to the Multiplex lineup. While not a scale model of any one particular historic aircraft, with a little personalization it can easily it resemble your favorite prototype, real or imagined. On a Sunday afternoon with the Daytona 500 on the television and the surround sound up nice and loud, I chose to get started on the new Escapade .61. As you would expect from Great Planes, all pieces are individually wrapped in plastic and well packed. As I removed everything from the box, I was surprised and admittedly happy that there were so few parts and pieces. Could I actually get this done in one day? Although modern ARF aircraft are remarkably complete right out of the box, there are still many steps that require some workmanship to complete the model. 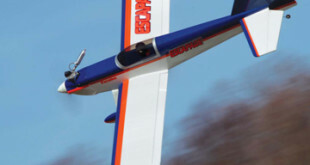 This month's article will cover some of the different techniques to finish the airframe assembly, allowing you to match your efforts to the kit's high quality. If you are an avid model builder, you most likely have an important instrument in the toolbox called an Incidence Meter. For you newcomers, this device allows you to measure the alignment angles of your wing, tailplane engine thrustline and fin to the fuselage itself, so that the aircraft will fly correctly. On high-performance models, these incidence angles are critical to attaining top performance. Mostly used when building models from a kit, plans or scratch-built, an incidence meter is also very handy while setting up most ARFs. 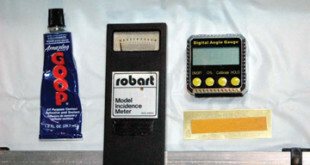 One of the most popular incidence meters of all time has got to be the Robart Incidence Meter. It is simple yet very effective, using a pendulum type pointer set against a printed gauge face to provide you with the measured wing angle in degrees. 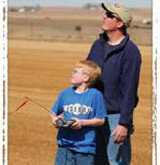 It is now summer 2011 and still there are two questions that crop up in my emails. Can you equate an electric motor to a glow equivalent? How do you go about converting a glow model to electric? The answer to the first question is technically no, but manufacturers do and they are doing the motor a disservice by doing so. The answer to the second question is the main thrust of this article. Take our Hobby Glue Survey!